Kurtis Eugene Warner is a famous former American football player who played in the NFL. Kurt is currently working for the Westwood One radio as their full-time radio analyst. Kurtis Eugene Warner, reportedly earns around $4,003,480, as his yearly salary from the network. As of 2019, he reportedly has an estimated net worth of over $30 million. He is currently married to his longtime girlfriend Brenda Warner. Kurtis Eugene Warner was born on June 22, 1971, in Burlington, Iowa to parents Gene and Sue Warner. He is of American nationality and belongs to the White ethnic group. Kurt's parents divorced in her early age of six and since then Kurt started living with her mother and brother. Kurt has a very much caring and supportive family. Kurt completed his schooling from Regis High School. After that, he attended the University of Northern Iowa from where he graduated in Communications in 1993. The American sports analyst Kurtis Eugene Warner has an estimated net worth of $30 million similar to that of LaDainian Tomlinson. As of 2019, he receives an annual salary of $4,003,480 from his successful career with Westwood One. Signed a 7 year $47 million contract with St. Louis (STL) in FEB 7 2000. Kurt earned a total of $62,773,000 from his twelve seasons in the NFL. Kurtis Eugene Warner is one of the most popular Westwood One analysts whose career as a sports analyst has been successful. Since Westwood One is a popular sports network, it is well- known for paying its sports analysts a high salary. 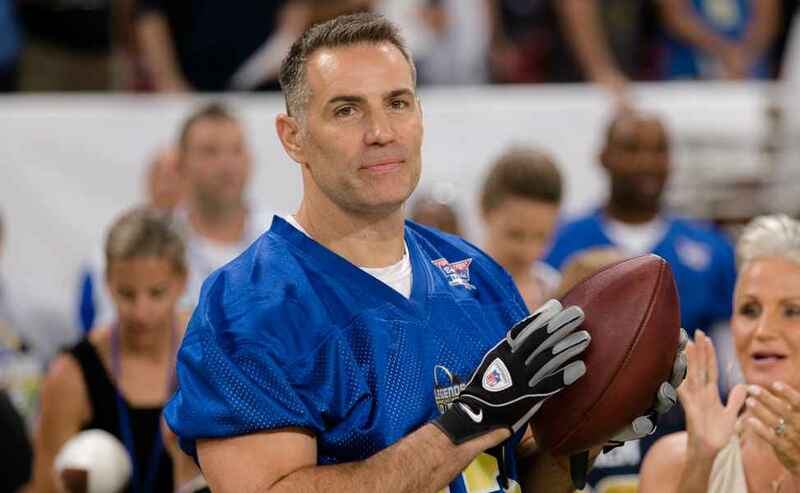 Amway North America signed a multi-year endorsement agreement for the Nutrilite brand and it also donated $50,000 to the Kurt Warner's First Things First Foundation. Kurt has also invested in the South Asian Professional football League called Elite Football League of India. The total investment amount of Warner remains undisclosed, although $50,000 will go towards donating football to schools and poor children in India. Kurt is married to his girlfriend Brenda Carney Meoni on October 11, 1997, at the St. John American Lutheran Church. They married after being in an affair for a long time. Kurt has three children with his wife Brenda. Kurt's wife Brenda is a former U.S. Marines Corps. She was married to her previous husband who she divorced before getting married to Kurt. She has two children with her former husband. Later on, Kurt adopted her two children and now they have altogether five children. The couple is living a happy married life since there is no news of their separation. The famous radio analyst and the former NFL player is 6 feet 2 inches tall in height and weighs around 214 lbs. Besides he has a huge number of fan following on his social accounts. Besides being a famous personality, he is very much active in social charity works and he started an organization called First Things First Foundation. Warner started his playing career after being drafted in the 1994 NFL Draft by the Green Bay. During his playing career, he played with several teams like Iowa Brainstormers, Amsterdam Admirals, St. Louis Rams, New York Giants, and Arizona Cardinals. Kurt is among the two quarterbacks winning SuperBowl in their first season including Tom Brady. He played altogether 12 seasons in the NFL. During his career with Giants, he was substituted by Eli Manning after he lost two games. Warner retired from the NFL in January 2010 and began his broadcasting career with NFL Network. Moreover, he worked for FOX Sports as their color analyst covering NFL alongside Chris Rose.